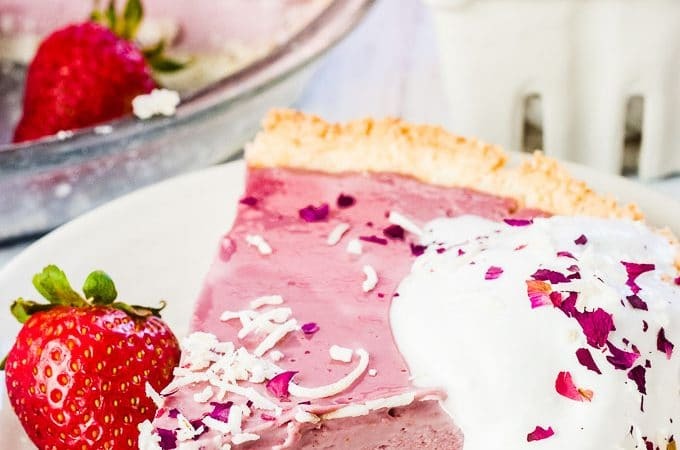 This pretty pink Vegan Strawberry Cream Pie is as delicious as it gets. 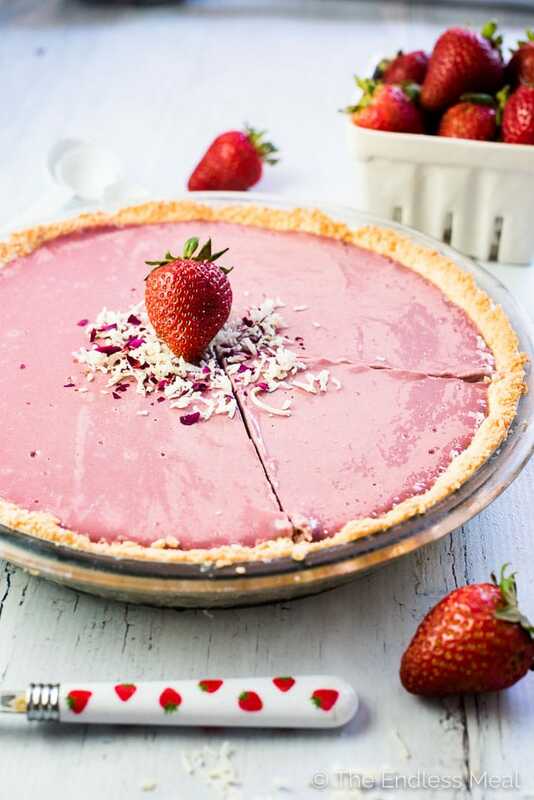 It's made with creamy strawberry cashew custard and a coconut crust. It's a naturally dairy-free + gluten-free + paleo dessert recipe that everyone will LOVE! Grab a plate, my friends! I have made us the prettiest Strawberry Cream Pie.? That slice you're looking at there is everything creamy and strawberry-y and delicious. It's quickly becoming a summertime fav around here. This is the point where I feel I have to tell you that this pie is also a bunch of other things that normally wouldn't get me super pumped about a dessert recipe. Promise you'll hear me out before you judge? 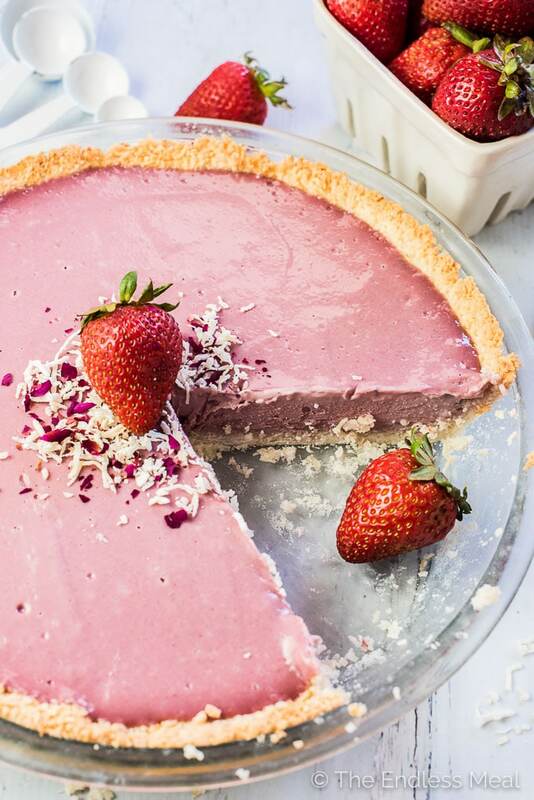 That pretty pink pie is also vegan + paleo + gluten-free. ? I know it sounds crazy, but it's true. And the best part is that all of those extras make this even better than a traditional strawberry cream pie. I've made the strawberry cream part with cashews. If you've ever made a creamy vegan dessert, you'll know that cashews are the vegan answer to whipping cream. They make this pie every bit as creamy and delicious as a traditional dairy filled version. Even my handsome man, who usually scrunches up his face like he's being poisoned when I say I'm making something vegan, told me that that this pie was crazy delicious. Win! I know that you and I share a love of healthy foods. We like to switch things up and use ingredients that are better for our bodies. We like to experiments. Here's the thing, though. When it comes to dessert, if it's going to be healthy, it's HAS to be absolutely, amazingly delicious. I mean, the whole idea behind dessert is to treat yourself to something sweet and tasty. If it's neither of those things then why even bother? I'm looking at you, dry cardboard-like gluten-free desserts. Gahhh. When I started making this recipe, I knew it had to be extra special. Otherwise, I'd scrap my plans and grab a jug of whipping cream. 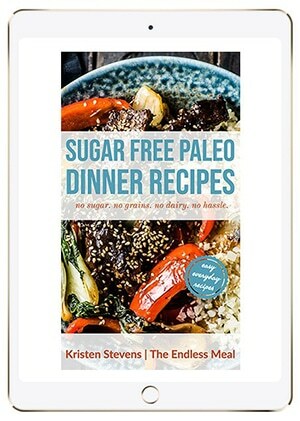 But I knew that I'd feel so much better if I could figure out how to make a dairy-free version. They prob bug me more than they realistically should. It's not that they're all terrible. I've had some great vegan freezer treats that have sent me asking for seconds. What bugs me is that they HAVE to be frozen. A strawberry cream pie (IMO ← in my opinion) should not be frozen. That would be an ice cream pie. I'm sure it would be delicious, but it's not the same thing. The reason many vegan desserts need to be frozen is that they melt into a coconut milky mess when they're at room temperature. They need to be frozen to keep them looking like the traditional dessert they are trying to replicate. Coconut oil is solid when it's stored below 20 degrees Celcius (That's 68 Fahrenheit for all my American friends.) In other words, it doesn't need to hang out in the freezer. Fat = creaminess. It's why whipping cream is creamier than skim milk. 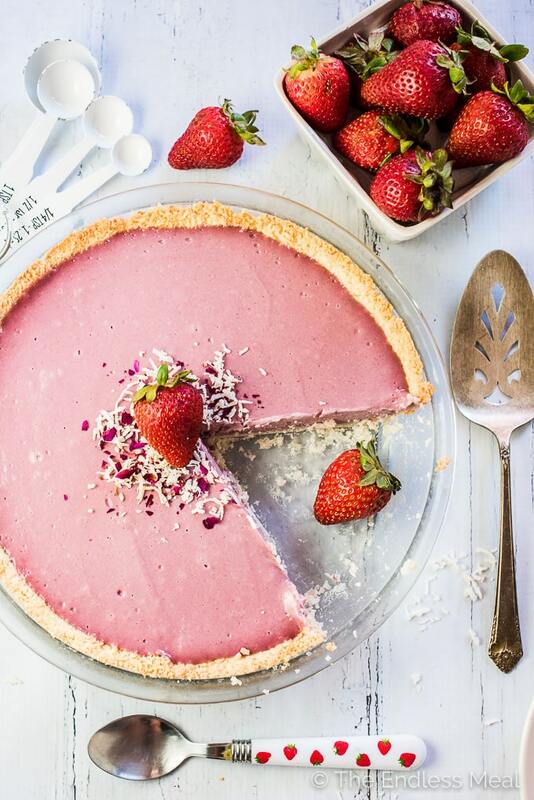 It's also why this strawberry cream pie, with its fatty cashews and coconut oil, is the creamiest and most delicious thing ever. 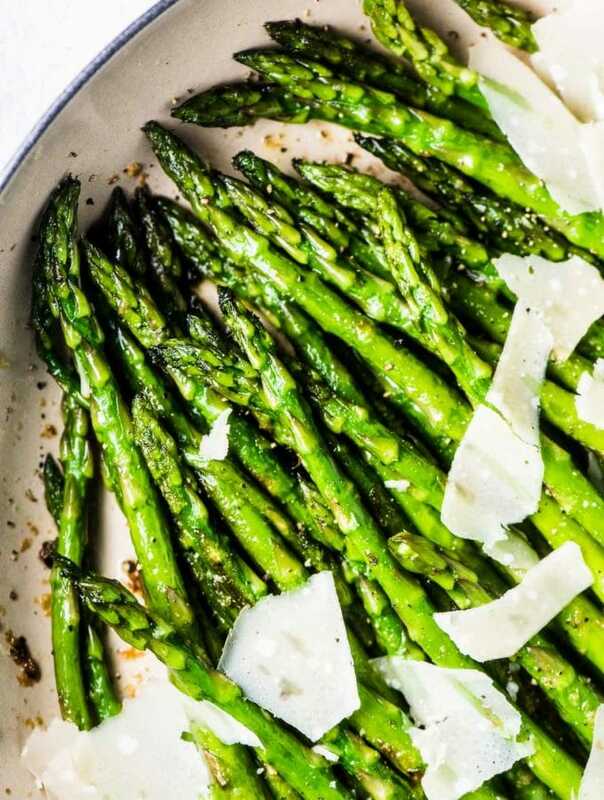 Let's give it up for healthy fats! 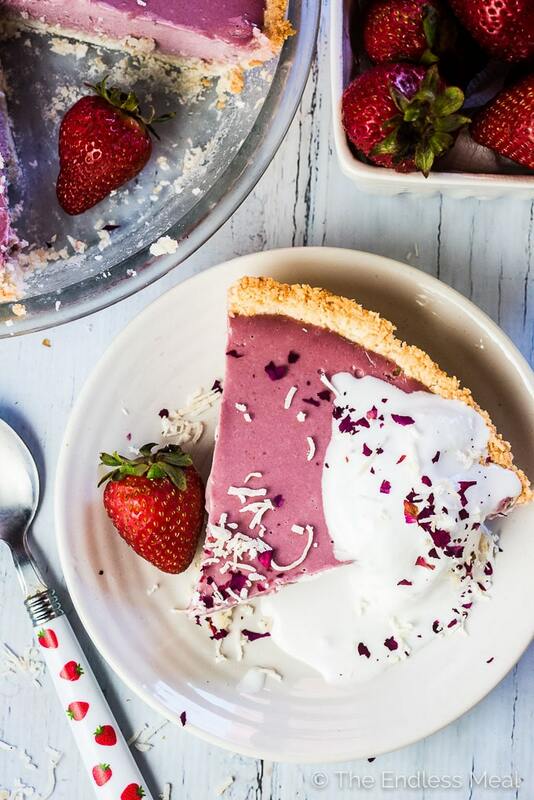 If you make this Vegan Strawberry Cream Pie make sure you snap a pic and tag #theendlessmeal on Instagram so I can like and comment on your photos. I love seeing TEM recipes you create! Grease a 9″ pie pan with a little coconut oil. Preheat your oven to 325 degrees. Add the coconut, coconut oil, sugar, and chia egg to your food processor. Process on high for 1 minute. Transfer the coconut to the greased pie pan and press into the bottom and up the sides. Bake for 15-20 minutes, or until the crust is light brown. 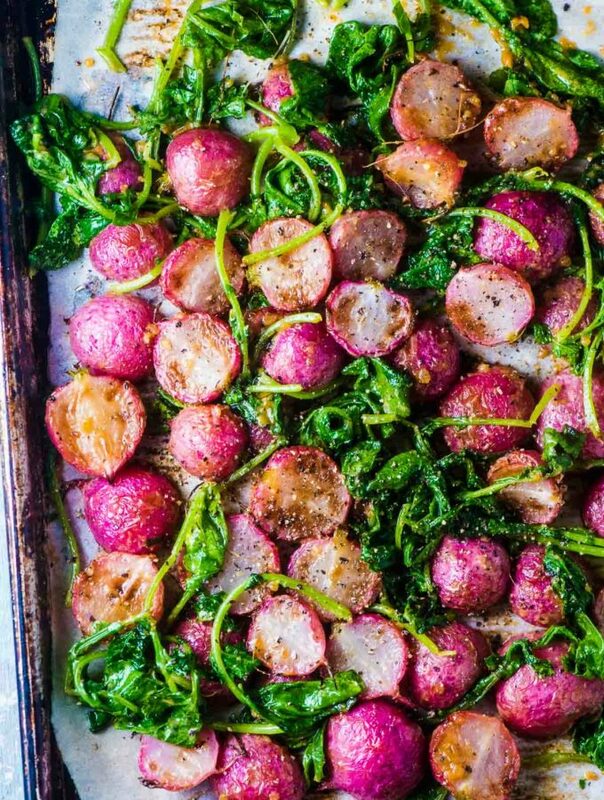 Remove from the oven and set aside to cool. Place the cashews, strawberries, coconut oil, 1/4 cup sugar, sea salt, and lime juice in your high-powered blender or food processor and blend on high until creamy and smooth. Taste and add more sugar if you'd like it sweeter. Pour the pie filling into the pie and smooth the top. Place the pie into your fridge, uncovered, and let it set for at least 6 hours. If you would like a firmer filling, freeze the pie for 2-3 hours. Serve the pie with some coconut whipped cream and fresh sliced strawberries over the top. To make a chia egg, mix one tablespoon ground chia seeds or flax seeds with three tablespoons of water. Let it sit for 15 minutes then use it in the recipe. A high-powered blender works the best to make the cashews super creamy. If you don't have one, soak the cashews for at least 4 hours. Hi! What’s the purpose of the cashews? What if I don’t have cashews? Can I substitute something else? Is it to help give the filling body and taste? This is the best strawberry cream pie ever! It’s so creamy. I thought I wouldn’t be able to have desserts like this when I turned vegan but am so happy that I can now. Thank you for the great recipe! This really is just the loveliest thing! Love the pretty pink hue and ADORE the coconut quotient (HIGH) in this recipe!